Good hello everyone! I can't believe it has been so long since I've written to you all! It's been a crazy year, and I'm so pleased I'm back. I won't go into the details of why I was away, because I'd be here all day, but let's just say that things have been very difficult, however now they're getting easier and I finally have the mindset where I can return to the lovely world of knitting. 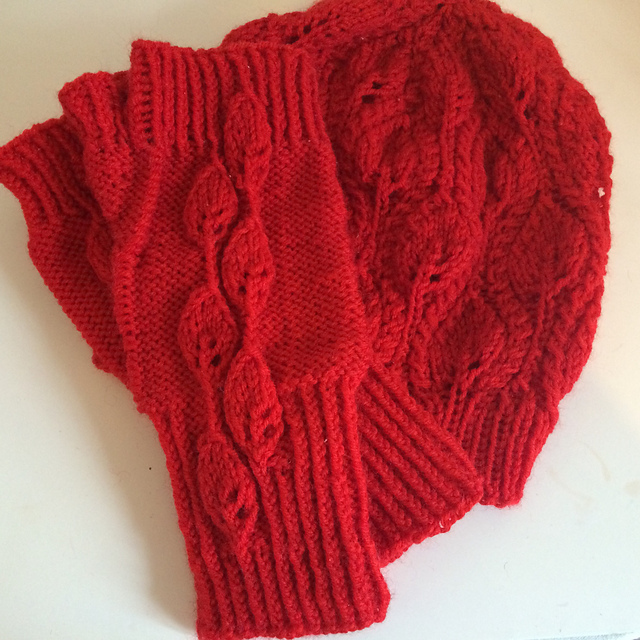 Talking of the wonderful world of knitting, let me tell you all about what I made this week! It has finally started getting colder here now, so people are wrapping up in every knitted item they can find. My lovely friend Selena is always out in the cold, and I never see her wearing hats or mittens, so I thought I'd solve that problem by making her a matching set! After a dig through my stash, I found two skeins of King Cole Woolmix DK in the 9 colourway (red). They were a gift from my Nana, when she was clearing out her stash. Who knows how long she has had them in her possession, as Woolmix is now discontinued! Selena looks wonderful in red, so this seemed to be the perfect choice! One enjoyable stroll through Ravelry later, I settled on the Foliage Hat by Irina Dmitrieva. This simple beanie has a lace leaf design through the entire piece, making it perfect for late Autumn knitting! I used my Addis Click Lace circular needles in size 3.75mm for the ribbed brim, and 4mm for the main body of the hat. I love using these needles, especially for lace projects. 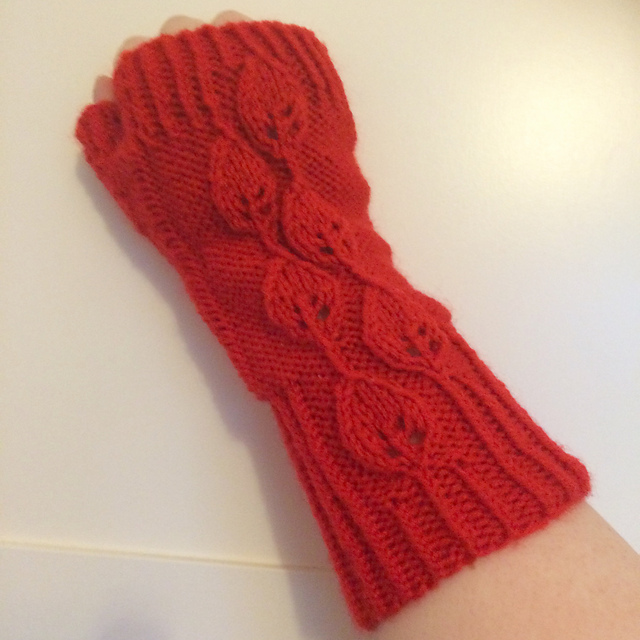 The stitches elegantly slip off the needles, and the project gets done in no time at all! 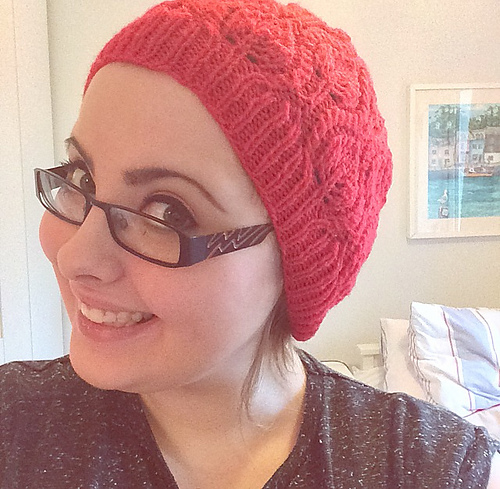 Which is just happened with this project - within 2 days I had knitted up a lovely lace beanie! After I casted off Selena's Foliage Hat, I returned to Ravelry to find a matching mitten pattern. It didn't take long for me to find Autumn in the Ozarks by Amy H. Aymond, which is fingerless mitten pattern with a similar leaf design running through the mitt, while being encased in a sea of purls. I knitted the pair up in three days while watching Dr Who, and I have to admit, it wasn't the most enjoyable of experiences. The pattern was written very well, and is definitely worth the money... unless you're a complete plonker like myself. Instead of knitting them using magic-loop, I used DPNs. Which is fine, except instead of splitting the stitches onto three needles (using a fourth to knit with), I only used two needles (using a third to knit with), as the pattern instructed me to (but only because I was supposed to use magic-loop... I have no common sense!!). Which resulted in there being two big loose stitches running up either side of the palm of the mitt - it looked terrible. I think I also should have gone down a needle size when I got the palm, as it turned out a little baggy. By the time I casted them off and tried them on, I just wanted to frog them and start again. However, when Selena came to visit, my younger sister forced me to show her the set I was making. Selena loved them, and insisted that they were perfect and I should hurry up and knit the other one, rather than ripping them up. Reluctantly, I casted on the second mitt and knitted away, this time making sure I split them onto three DPNs! Within a week I had managed to knit up both projects, which I am rather pleased about! Normally I get distracted and "treat" myself by making something I want in between projects, but I stayed focused and made sure I got these done as quickly as possible. Yay! 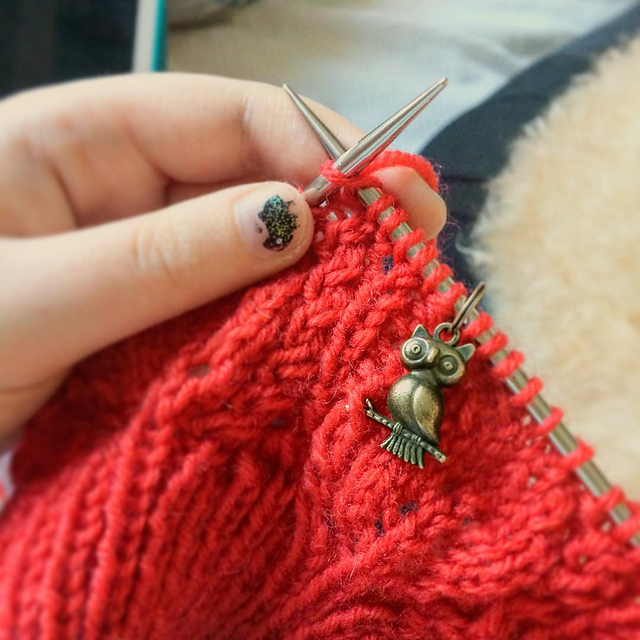 I like your stitch markers! You made a wonderful combination with these patterns, and the red color-just beautiful!